The Castle Creations BEC 10A Battery Eliminator Circuit is a little device that eliminates the need for a receiver and servo battery pack. It draws higher voltage from the motor batteries and drops it to a voltage level that is suitable for your receiver and servos. This is required in applications which draw high power for multiple servos or use more than 3S motor packs, as most ESCs with linear BECs are not designed for these applications. Only 11 grams! 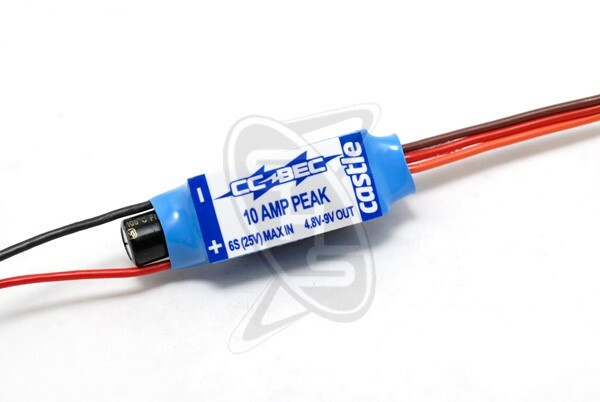 The Castle Creations BEC 10A Battery Eliminator Circuit supports up to 10A max ouput and 6S max input. It has 4.8 - 9.0v selectable outputs.